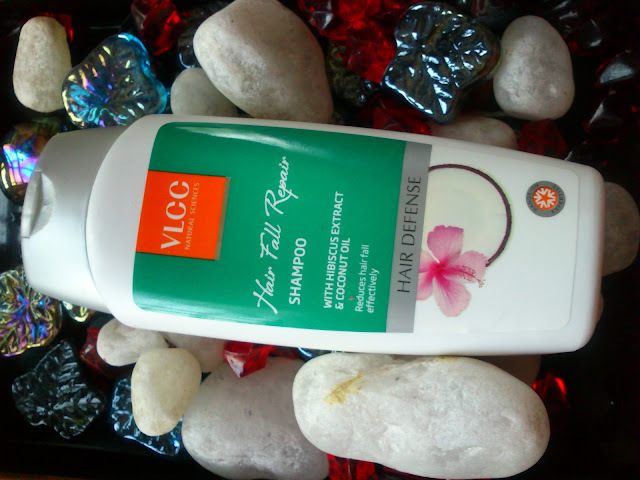 I am going to review VLCC Hibiscus Anti Hair Fall Shampoo. 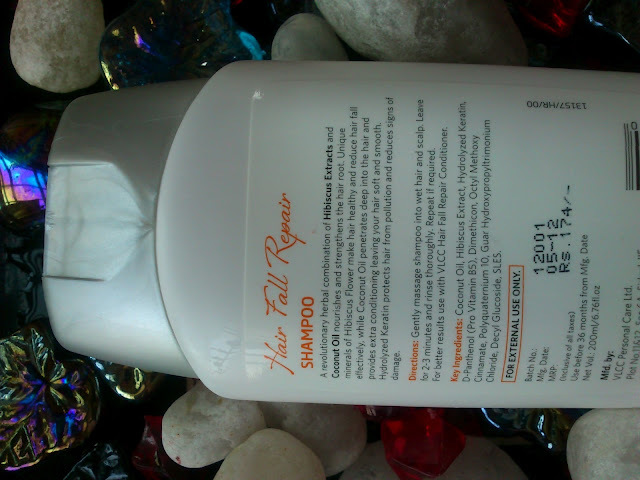 I bought this hair fall shampoo because I wanted something herbal for my hair. VLCC is well known brand for its herbal skin and hair care products. I am in searching of a shampoo not only herbal which shouldn't contain SLS and SLES which is allergy for me, at last I found this shampoo which is claim to be free from SLES and I bought it immediately. Price Rs 160 for 200 ml. A revolutionary herbal combination of hibiscus extracts and coconut oil nourishes and strengthens the hair root. Unique minerals of hibiscus flower make hair healthy and reduce hair fall effectively, while coconut oil penetrates deep into the hair and provides extra conditioning leaving your hair soft and smooth. Hydrolysed Keratin protects hair from pollution and reduces signs of damage. Usage: Use once or twice a week depending upon the condition of your hair. This shampoo comes in a white sturdy plastic bottle with flip open cap. It is travel friendly. This shampoo looks like milky white liquid and smells very pleasant. I am so excited to use this shampoo and at the same time I don’t have hope about the shampoo until I started using it. Yes, it is white and creamy liquid also has herbal smell which I like it. I usually massage my hair by coconut oil before half an hr. But all shampoo which I tried will dry out my hair. But, you know this shampoo really awesome that makes my hair so soft and shiny which I remember those days when I use natural homemade herbal powder on my school days. Yeah really nice and I am so happy. Very little amount is enough to wash my hair each time. My mom herself told your hair looks so shiny like your school days hair. It makes my hair really soft and manageable. It looks shiny and straight. I have tried so many shampoos which is not giving satisfactory results. This shampoo reducing my hair fall slowly. I always want all products in herbal formulated. So, this shampoo suits me very well mentally and physically :). I have bought the conditioner from this range and loving it to the core. Both of this combination makes my hair happy and leaves soft, silky and shiny. Cleans my hair very well. Makes my hair really manageable. Makes my hair soft and shiny. Reduces hair fall by regular use. I didn't find any cons, I am happy with this shampoo. Hope you all find useful information in my review. Wow, I am happy to know this shampoo worked so well for you. Otherwise most shampoos these days are full of harmful chemicals and rather cause hair fall. Hi madam, I read ur post , I have dandruff and hair fall ? What shampoo helpful to get rid of dandruff and stops hair fall? Can you give me a suggestion? can this shampoo be used for chemically treated hair ?? ?